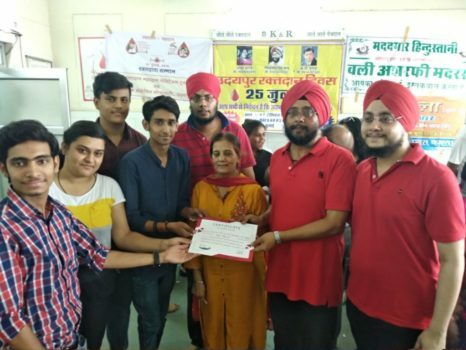 A blood donation camp was organized at RNT Blood Bank, M.B Hospital, Udaipur on the 25th of July, 2018. The drive was organized by Rakt-Dan Mahadan Charitable trust in collaboration with Udaipur Vibes. The Udaipur Vibes team including Ayush Vyas, Aparna Chakravorty, Nayan Pancholi and Dhruvil Dave, were present during the entire donation drive that begun at 8 in the morning and concluded by 3 p.m.
Dhruvil also became a part of this noble act by donating 1 unit blood at the drive. Certificate of appreciation were provided by Udaipur Vibes to all the volunteer donors at the drive. 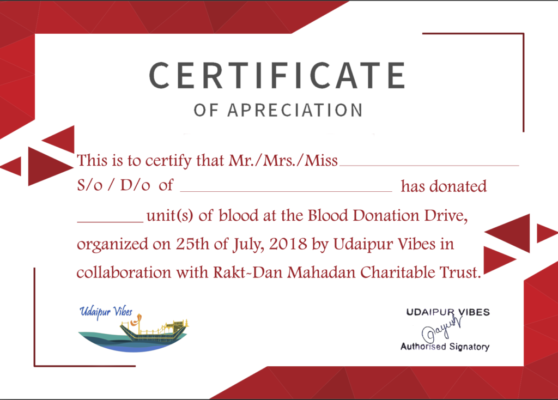 A total of 100 donors were given certificate of appreciation by the Udaipur Vibes team for this noble cause in collaboration with the Rakt-Dan Mahadan Charitable Trust.